Oh, my heart. I adore this boy. I love being the mom of a boy. Not having any brothers, I never experienced some things that I get to experience now that I have a son. I am learning more about legos and trucks and superheroes than I ever did before. 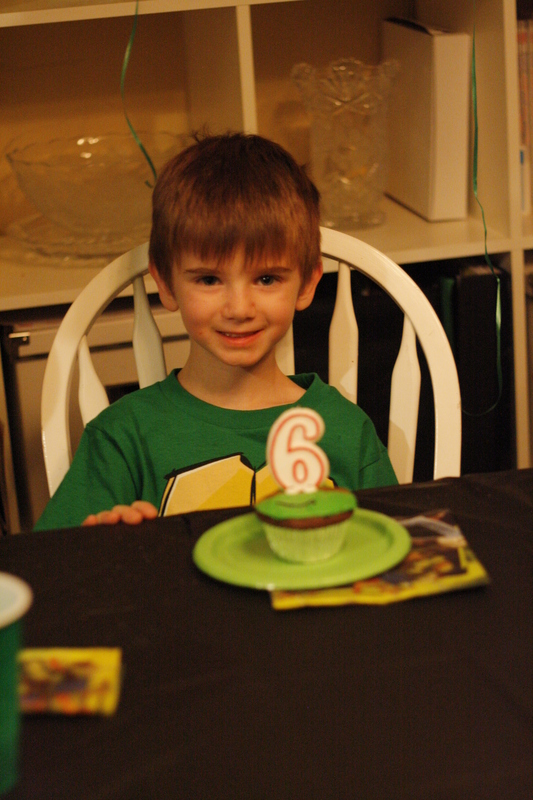 Carter-Man turned 6 and we had a fun little TMNT party at the house last Friday evening. He just wanted to invite a few boys over (woohoo—only 6 boys and not 26!). Since it was a small group, I made the time to make some fun things for the boys. I got most of the ideas via google and Pinterest and will try to link everything back to where I found it at the bottom of this post. Hover over each pic for a caption and/or click on it to see the photos full screen. Turtle Shells made from foil roasting pans, green spray paint and some ribbon! Masks were purchased from Target. Green hawaiian punch with my iphone flashlight shining behind it! Keep the balloon in the air. So, I may have finished these while sitting in the school pick up line! Plumbing tubing, green duct tape and rope. They had to stack the cups, then knock them down with the nun-chucks. So, I took this picture to my local pizza place to ask if they could do this one one of the pizzas we were ordering for the party. They said they would but…. This is how the pizza looked when it arrived! #pinterestfail hahahaha! Hilarious!